Bathwraps – Bathroom remodeling products from Bathwraps are made of nonporous acrylic, resistant to the growth of mildew and mold, and are available in a wide range of colors and styles. Bathwraps is one of the industry’s leading manufacturers of acrylic replacement showers, acrylic replacement tubs, and bath accessories. 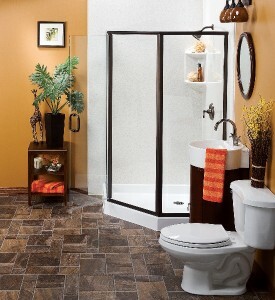 The Onyx Collection – Products from The Onyx Collection that we install include tubs, shower pans, and shower surrounds. All are made of solid surface material, take just one day to install (just like acrylic products), and come backed by a forever warranty. Safe Step Walk-in Tub Co. – This company is one of North America’s preeminent walk in bathtub manufacturers. If you are thinking about installing a walk in tub as part of a bathroom remodeling project, please know that walk-in tubs from Safe Step are 100 percent made in the U.S.A. and come with a wide variety of safety and therapeutic features. For more information, please contact U.S. Patio Systems and Home Remodeling, a trusted bathroom remodeling contractor serving the entire Minneapolis, MN, area. We offer top value for your dollar, excellent customer service, and some of the very best warranties in the business.